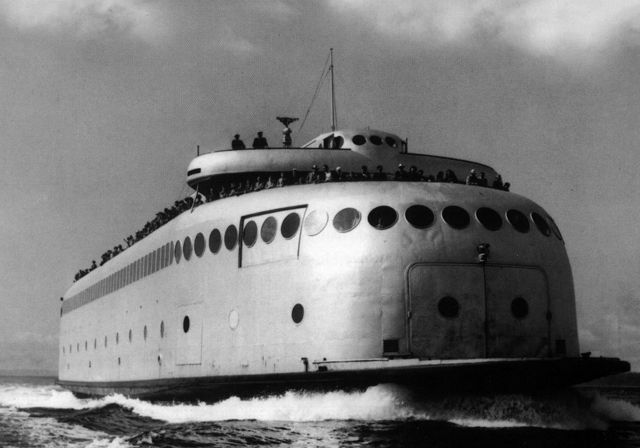 1935 ferry Kalakala in Tacoma. Photo by Joe Follansbee. The news I dreaded for years arrived this week. The 1935 Kalakala, the only art-deco ferry ever built, listed on the National Register of Historic Places, is headed for the breakers. Its death was slow, painful, and probably inevitable. It’s passing should not be a surprise. I listed it as endangered in 2011 and 2012 on my old Fyddeye website. The ferry is one of a handful of decaying large historic vessels, which include USS Olympia and SS United States, both in Philadelphia. Our national patrimony is rusting away. For a generation in Seattle, Kalakala’s sleek design and quirky behavior stood for a city of chance-takers and idea-evangelists long before the Space Needle was built in 1963. I got to know her after the sculptor Peter Bevis rescued her from oblivion on tide flats in Kodiak, Alaska in 1998. That was the beginning of her end. I was at the auction when the 276-foot “silver slug” was taken away from Bevis in 2003. The new owner, Steve Rodrigues, had big dreams, but no money and even less political savvy. He blames her final disposal on a “conspiracy” among the U.S. Army Corps of Engineers, the Coast Guard, the State of Washington, and the cities of Tacoma, Seattle and Kodiak. The facts are simpler: He neglected to pay her bills, and ownership fell to Karl Anderson, a Tacoma businessman. He’s had enough of her; she’ll be shards of metal by the end of this month. 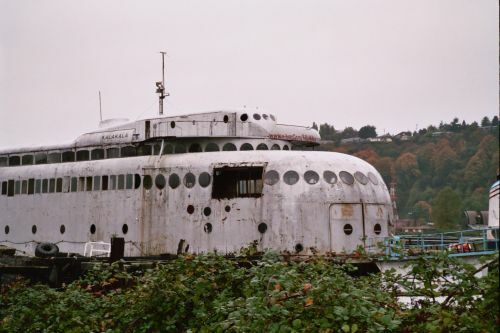 Kalakala is the second large historic ship lost to the breakers in the Seattle area in a little more than five years. In 2009, the 165-foot, 1897 schooner Wawona, also on the National Register, was demolished after a 46-year effort to preserve her. (Shameless self-promotion: I published a history of the Wawona, which you can buy on Amazon.) I can’t think of Wawona without bitterness, because so much of her demise resembles the final years of Kalakala. Kalakala under way in Puget Sound. I visited Bevis once at Kalakala. He was grinding rust off the boat’s skin, and he looked like an ant on an elephant. I remember working in Wawona’s dark hold and thinking of Jonah in the belly of the whale. That’s the main problem with preserving large boats: they’re freaking huge, and that means big money. If you’ve ever remodeled a house, imagine the same project a gazillion times bigger. Anderson estimates that $25 million would do the job on Kalakala. Rodriguez once had a plan for a $35 million restoration. Wawona’s sister ship, C.A. Thayer, now in San Francisco, was restored at a cost of $12 million ten years ago. Repairing Olympia’s hull, paper thin and leaking in some places, will cost millions. The SS United States costs her owners $800,000 a year just to keep her afloat. Money is important, but I’ve never believed that the lack of cash is the biggest barrier to success. The biggest hurdle is competent leadership and an organizational wherewithal to do the necessary legwork. That means kissing up to governments, foundations, and large donors, and building a political base with a vision that extends beyond the boat. Restoring a large vessel is a business, not a hobby. Time and time again, I heard Wawona and Kalakala supporters beg for a shortcut: Why didn’t a rich guy (usually Bill Gates or Paul Allen) write us a check? Isn’t our preservation project intrinsically good, like the sunrise? Ironically, most rich people are tight with money. I’m not rich, but I wouldn’t write them a check either. The real losers are young people, who won’t have an opportunity to experience something of Seattle before hipsters led by a braces of pugs took over the neighborhood. OK, Seattle has some big boats, but no historic ferries or working vessels from the Age of Sail. The coolest thing about these big ships is the stories. Without them as a platform, the stories will disappear into the sub-basements of libraries, or unvisited recesses of obsolete Kindles. Here’s hoping we won’t see another loss like Kalakala for a long time.